The Skimz BR83 is fitted with a VSC1200-DC (1,200 l/h) pump that lets you control the flowrate using the variable speed controller and can hold up to 400ml of media. The BR83’s bracket can be used as a hang-on or attach horizontally to the brace of the tank. The bracket will fit up to 19mm thick glass or acrylic. Fine media sponges included for use with carbon and GFO media. wanted to know the reactor dimensions? 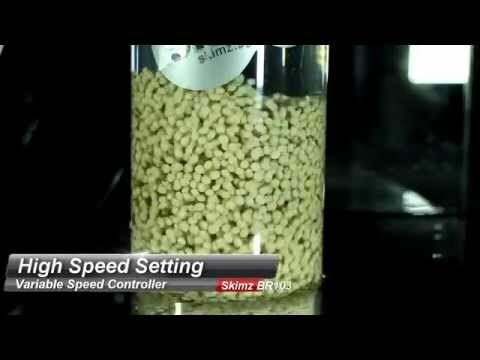 I need a Skimz BR83 Bio-Pellet Reactor with ID of 3.26in and 20in Height ? Do you have reactor with such dimension? Please note that BR83 is only 16.5" tall. If you need larger reactor, BR103 is 19" tall with 5" diameter. What do I need to do to use this reactor as a carbon reactor not a bio pellet reactor? Can I do both at the same time? BR83 reactor comes with top sponge which should be used with finer media like carbon or GFO. We do not recommend mixing two different medias in the same reactor since each type of media has different life span. When It came, set it up and pump never powered up? Took it apart which is so easy and never skipped a beat after that. Never seen such a small dc pump like this. Coolest little pump there is. Have it on the first speed and pumps a lot. Went down the road before with too much bio pellets and massively cloudy tank the next day! This is perfect and my tank is 180 gallons and this is enough. Very well made and durable, quiet and the controller is even real little ...too much.